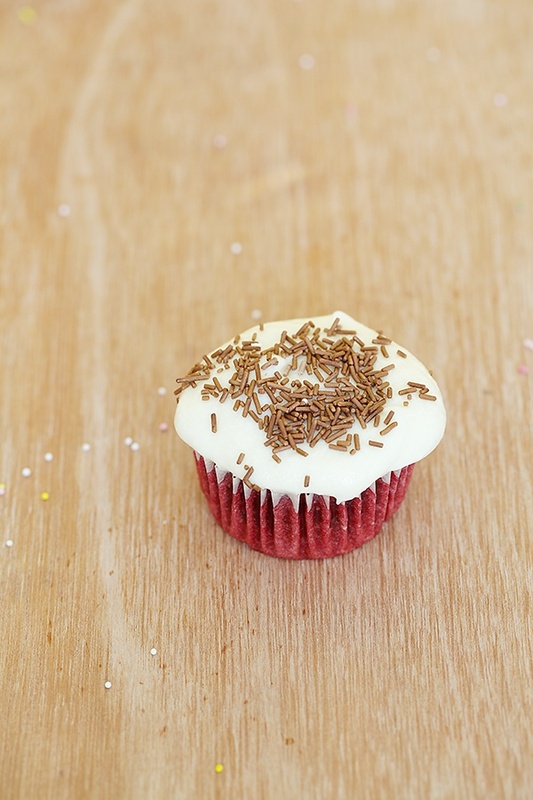 There are many theories around the origin of the red velvet cake. Be it the story of a 1950s housewife mixing in a lot of red colour into her cake batter, careless measuring or an American corporation selling red food colouring during the “Great Depression” many assumptions circulate around this popular cake. Visual appeal being an important aspect of the way one perceives food, there is no doubt about the popularity of this cake owing to its vibrant hues. I love colours! There is no denying that. But I do shy away from using artificial colours in my kitchen. And considering the widespread fame of the said cake, I started to chase the dream of making an all natural red velvet cake that would score brownie points in both the looks and the health aspects. 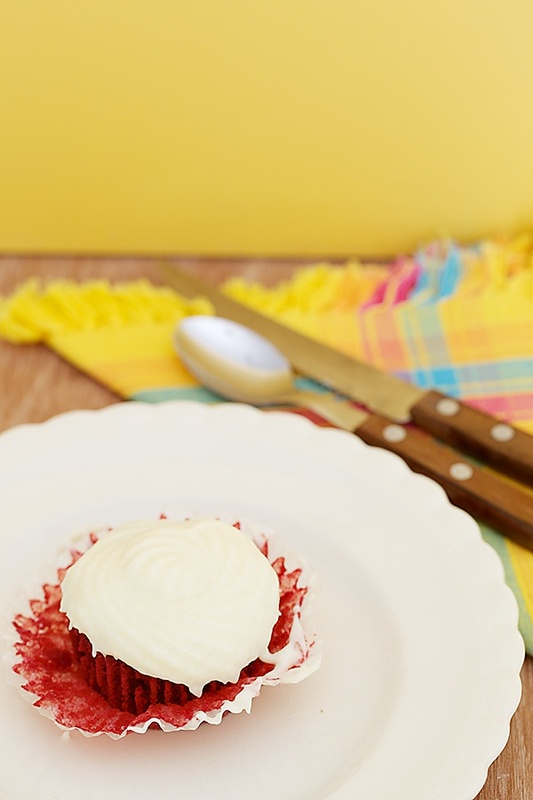 Using beets in a red velvet cake is not something new. But, I did play around with my chocolate cupcake recipe to get that lovely hue making many alterations in the bargain. I read in Harold McGee’s phenomenal “On Food And Cooking The Science And Lore Of The Kitchen” that beets owe their hues to betain pigments and that they tend to lose their vibrance in alkaline conditions. So, this meant skipping the soda bicarbonate. The result was a soft and moist cake with a resonating and rich, reddish pink hue and the best part was no trace of the beets was reported by folks who tasted them. These little beauties won rave reviews from everybody who had them. And the fact that Hari did not eat them (the picky eater that he is) was compensated by his 2 friends enjoying every morsel of the cake. The deep reddish pink colour of the cake contrasts beautifully with the creamy white colour of the frosting making it a visual delight. You could keep the frosting plain or sprinkle it with a few sprinklers to add more charm if children are going to be eating them. And knowing the source of this beautiful colour makes sure there is not much guilt attached when I feed them to my family and friends. It is important to boil the beets with their skin to get maximum colour from them. Take 2 medium sized beets (measuring roughly 200 to 225 gm), wash them and cook in a pressure cooked until tender without peeling them. This ensures that you get the maximum colour out of the beets. Once the beets are cooked through, allow to cool and peel the skin. Chop into pieces and blend to a puree using approximately 4 tbsp water. In a bowl assemble all the dry ingredients the plain flour, cocoa powder, baking powder and salt together and sieve once. In another bowl put in the milk and vinegar and allow it to sit for about five minutes. Put in the granulated sugar and oil and blend with a blender until the sugar dissolves. Stir in the beet puree and the vanilla extract. Now put in the sieved dry ingredients into the liquid ingredients and beat until well mixed, about 3 to 4 minutes. With the help of an ice cream scoop or a spoon drop the batter into the cupcake liners and bake for about 20 to 25 minutes. * Using granulated sugar increases the weight of the sugar. If using powdered, castor or icing sugar, use 1 1/4 cup. Beat all the ingredients together with an electric mixer or stand mixer until smooth and fluffy. Hi Anu! I'm a huge fan of your website.I've been following your website for quite some time but never commented on anything. Anyway better late than never ! I have to say that your photos are simply stunning . I love the way you include your family while discussing your recipe. Makes it even more interesting ! The red velvet cupcakes look awesome. Can't wait to try them out ! All the very best to your website ! 🙂 Looking forward to seeing many more awesome recipes. One quick question…Is cream cheese readily available in Indian super markets??? 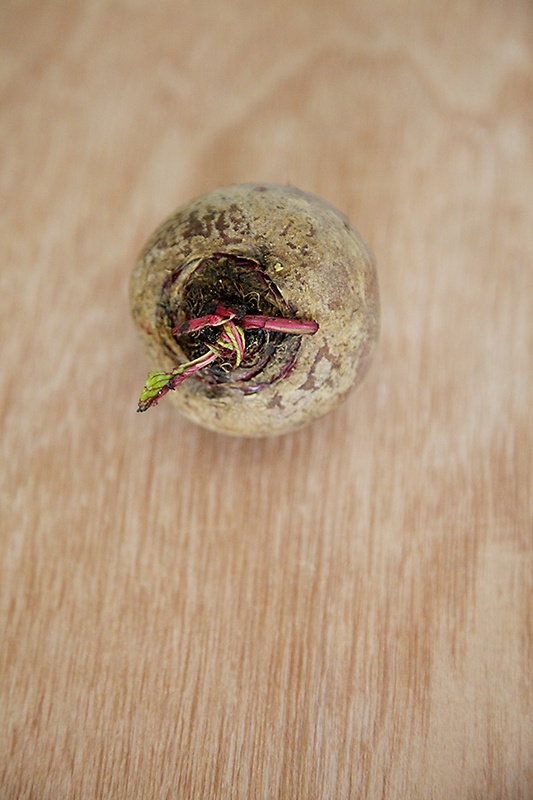 Love the idea of incorporating the beets for color….perfect timing. I will be baking them later today. Thanks so much for the recipe. Cant wait to try this out. In microwave, convection mode, what temperature should i bake the cake in? And for how much time approximately? 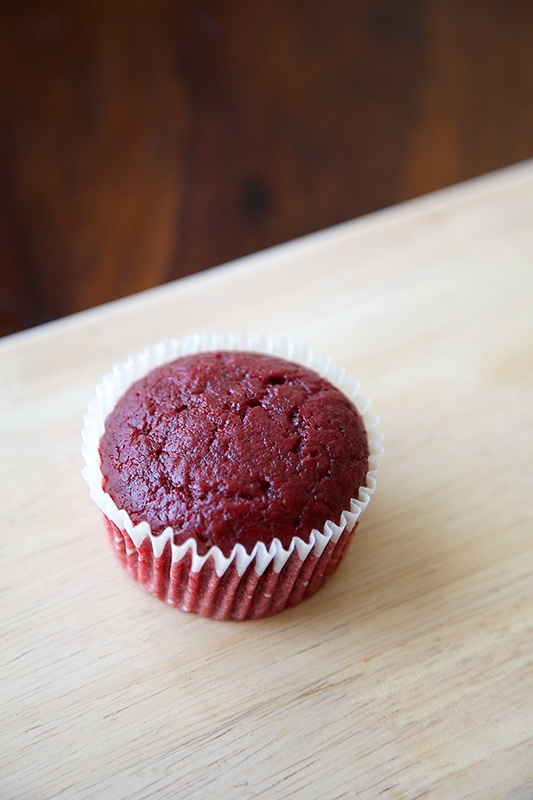 Oh.. just yesterday I was thinking about an all beet red velvet.. what I love your about your recipe is that it is a brighter hue than other natural red velvets!! Super stuff.. am definitely trying this out over the next week!! Thanks a lot for this lovely receipe. Since I stay in Mysore, I'm doubtful about getting cream cheese. Could you please let me know if it can be made at home? Padma: I hope you and your better half, both love it! Radhika: Thanks so much for your feedback! Honest opinion like yours helps me to keep going. And thanks for breaking your silence. Sita: Hope you enjoy it! Ranjita: I'm so sorry, but I do not use a microwave oven. Sarvani: I'm glad to know that! Hope you like it. Aarti: I have not tried making cream cheese at home. You can also top the cakes with buttercream icing. Brittania cream cheese (if not Philly cream cheese) should be available in Mysore. Good luck! hi Anushruti..i m new to ur blog and just trying this recipe..i wanted to know are u sure the measurement of plain flour is 205 gm and not 250 gms as 1.5 cups equals 250gms as far i know..i have added 205gms of flour and my cake is in oven.have kept my fingers crossed. Ashima: Don't know what your system of measurement is! A standard 1 cup (250 ml cup) of flour measures 140 gm of plain flour. And 1 1/2 cups is 205 gm. That is why it is best to measure in metric to avoid confusion of cups. If one goes by the metric measurements, especially while baking, there should not be a problem. I bake it today….it was just fabulous!!!!!! You are the best…I love your recipes especially because they are satvic!!!!! The measuring cup i have is not a 250ml cup its 200ml.Thats is why quantites that i measured were different and so i followed the metric measurements only.My Cake baked beautifully but it is not as red as shown in pictures posted here on blog. It is deep red on top (the crust)and rest whole of the cake has a light brownish tone.I followed the recipe strictly,where could have i gone wrong?Pls help! This is a wonderful recipe! I am also very skeptical about using artificial colors. I baked my kids bday cake last year with home made colors from blueberries, carrot and mango pulp. They loved it. I did try with beets but that did not come very well. Now, I know the reason. Thanks for sharing your research details. Food is all science. I like sattvic homemade food. I am surely going to try this one. Great work Anu! I am glad to be your blog follower. Happy Valentine's day to you and your family. Hi, you know I am and more so my daughter is a great fan of your website. She is dying to try this. We have mailed you in the past for vegan version of your cup cake and she baked them for a blue cross event. People were craving for more. Thanks a ton. Can I have a vegan version of this also please. Hi Anushruti ! Thank you so much for posting this wonderful and exotic recipe of red velvet cake on this Valentine's day. I made it and I got the exact same color and results as your pictures and did receive many compliments. You are really an awesome cook with Divine energies. I have tried almost all your recipes, especially cake recipes and they turn out just wonderful! No words to thank you…Eagerly look forward to new recipes on your blog, which I closely follow. Wish you all the best and ongoing success for your wonderful work. Loved how beautiful it looked without the artificial colors. I made pink cream cheese frosting with the beet juice :)..just love the way they look. Sita: Thank you. 🙂 So glad you had success with this recipe. Ashima: If your cup is 200 ml then it should measure less than 140 gm. If you are getting 250 gm, then something must be wrong with your weighing scale. Make sure your beet puree is smooth and that you mix your batter well. Raji: Thanks for your sweet words. Feedback from folks who come here is very important to me! Lakshmi: Ofcourse I remember you! Nice to know that you had success with my recipe in the past. Just substitute the milk with any vegan milk like almond, oat or soy and you are good to go! Asmita: I'm thrilled to know that you got the exact same colour! 🙂 Thank so much for your wishes. Much appreciated! Sandhya: Good to know that I posted something that you were looking for. Hi Anushruti… I was looking for an eggless all natural recipe and stumbled across yours… the pics look so tempting that I had to try this right away. The colour has come out very well and the taste is good too, however, the muffins haven't risen and are not spongy at all. What could be the reason? I followed all measurements strictly except for sugar which I added only 3/4 cups. Thanks! Thanks for the recipe .I made it on V-day and my husband loved it .The only prob i had was it wasn't as soft as normal cake.It was a little elastic.Can you let me know what was the reason? Great recipe. Could you let me know what vinegar is used? Regular white vinegar? Aparna: Overmixing, less raising agent in comparison to the flour could be some reasons. Ank: Too much liquid and overmixing are the reasons a cake becomes elastic. Stick to one method of measurement, cup or metric for both liquid and dry ingredients. aneesa: The beet has to well cooked and the puree very smooth. If this is mixed properly with other ingredients then you should get a uniform cake mixture. Radhika: Excellent! So happy to hear that your cakes turned out well. Hema: Yes, regular white vinegar. So happy to get ur reply dear…one more clarification…hw to cook the beet?i added a little water so that the cooker dosnt get burnt and cooked it until i cud peel of the skin.my puree was vry smooth.can i replace an egg for the milk and vinegar as i cud give it for my toddler. Oh my god….! These cupcakes were to die for! I made them for my brothers birthday and everyone was convinced they were shop bought. They were beautifully moist and they icing was great! I whipped double cream and folded the cream cheese frosting into it. In the uk you can't get high fat cream cheese, so beating cream cheese, just makes it runny. I loved this recipe, and am a new fan of of your great site! Can't wait to try a muffin recipe now. The only thing with the red velvet was, my cakes looked brown when I took them out the oven. But when bitten into, you cod see the colour, which was more purple, than red. Maybe it's just UK beets? 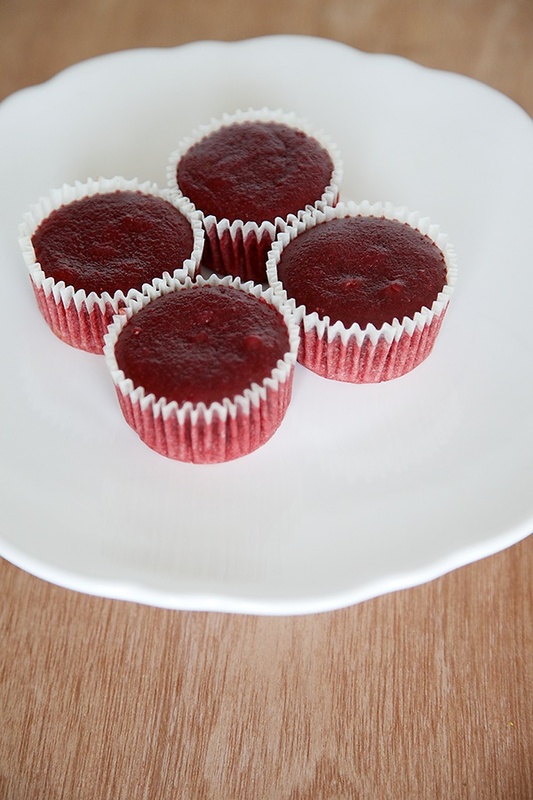 REd Velvet Cup Cakes look awesome Anu that too made so healthy with the beet puree!!! Happy Valentines Day to you and your family! thanks a lot for the lovely recipe, looking forward to trying it soon.. 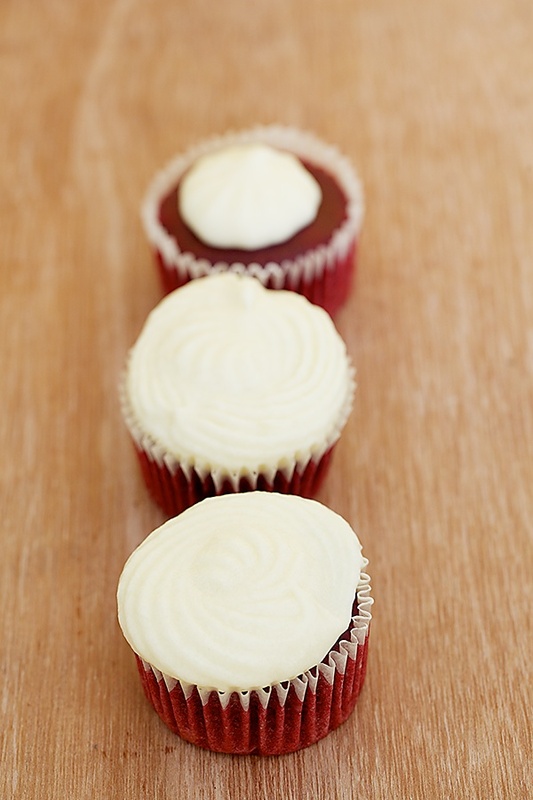 However I have a question, since we are adding pureed and cooked beet roots, what is the shelf life of these cupcakes? How long can one store them under refrigeration? Awesome cupcakes.. looks so elegant and delicious.. beautiful clicks too!! hi Anushruti… i love your reciepes and more over your presentation.. Actually i wanted to ask you your preferred brand for coco powder in cakes..
Ami: How nice to hear that! Thanks for the feedback! Hiral: You can store them for 3 to 4 days in the refrigerator. Shruti: I use whatever I have on hand..Hintz, Hersheys or even Cadbury at times. Your cup cakes look stunning ! Can I use apple cider vinegar as also skip the milk ? You can use apple cider vinegar and substitute the milk with soy milk, almond milk or other milk of your choice. Definitely going to try this one, am all for healthy substitutes – how long in the pressure cooker for the beets? Sneha: Depends on the beets actually. Could take anywhere between 2 to 4 whistles. The cupcakes came out good, but there was a vinegar after taste which I personally didn't like, (some found it OK though). Can vinegar be replace with lemon juice in this. ashwini: I'm surprised as one of the hallmarks of this cake is the absence of smell/after taste of vinegar. Which brand did you use? I use vinegar in cake recipes so that everybody (whoever tries my recipe) gets uniform and standard results each time. You can use lemon juice too, but the acidity varies and is dependent on the lime/lemon variety and quality. Hey Anu !! I loved ur recipe but I just wanna ask which ingredient will softened the cupcake ?! Because u haven't mentioned for butter ,I wanna prepare today itself plz try replying soon !! So shall put butter or not ?! Sanchita: Oil is used instead of butter here. Good luck! Thank u so much Anu Di !! Il feel make it today !! The label of my vinegar bottle has come off and I don't remember the brand. Which brand would you recommend? Does vinegar have an expiry date ? Hi anu,i liked your receipe.i want to make a 9inch cake with self-raising flour instead of plain flour?and also u haven't used baking soda can we omit that? Hi, Love the idea of this cake. I will be making it with whole wheat flour. I was just wondering if the cocoa powder was necessary? I am asking as i am making this cake for my son's birthday and one of the children in his class is allergic to chocolate (the poor thing). Will be great to know. thanks. Would this cake taste good without the icing ? I don't do icings. 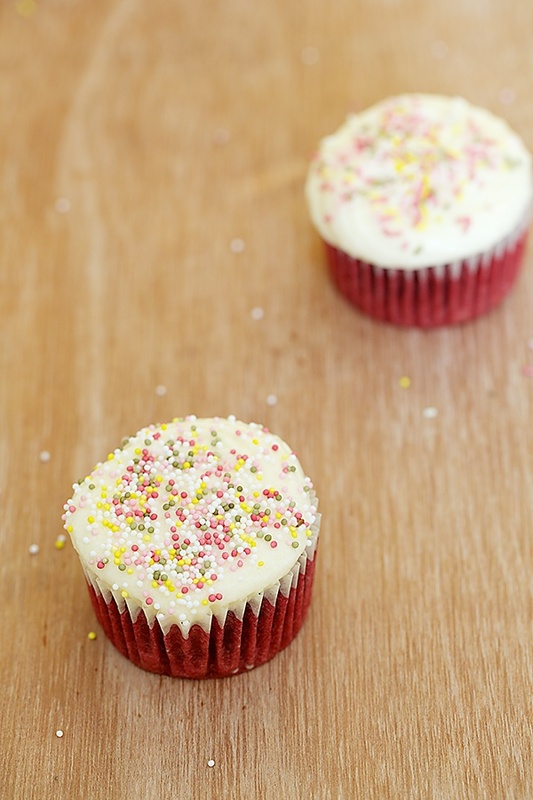 Next time when u publish a recipe, can u mention if icing is essential or optional Thanks. Rashmi: The cocoa powder is used to intensify the colour and flavour but I think in your case you could skip the cocoa powder. Anu: I will keep your request in mind. The icing will enhance the flavour of this cake. I wanted to check if i used a food colour instead of the beetroot do the compositions change ? sabrina: Yes..this recipe is based on using beets. They provide texture, volume and moistness to the cake, apart from the gorgeous colour! Uma: Please check my baking FAQ for the answers. Can i use home made cream cheese for the icing? Will it make a difference to the overall flavor or texture of the icing? Akshita: Depends on how the quality of your cream cheese would be. What should be the consistency of my homemade cream cheese? Also could you recommend a brand of cream cheese which is easily available in the local markets? Or the cream cheese which is sold by bakeries? Thank you so much for the recipe. I love Baking but eggs were the reason for which i couldn't do it @home.I cant wait to bake them for all my family members for the first time.My question is can i bake it in a normal 9" pan??? I've made red velvet cake with eggs before so just want to make sure if the temp and time is same as for cup cakes as well as baking tray. akshita:You can try Britannia although Philadelphia cream cheese is supposed to be the best! Madhuri: You can make this cake in an 8" or 9" round pan. You will have to increase the baking time accordingly, bake it for 40 to 45 min or until a skewer comes clean. Reduce the temperature to 160 C after 20 minutes to avoid burning the cake! Since cream cheese isn't readily available here, could you suggest an alternative to it or perhaps another frosting? I looveee your recipes! Looking forward to try this one out! Yashi: You could try my vanilla buttercream icing. Hope you like it! Hi! I tried these and they were amazing! Just a little question, can I substitute the red food coloring with blue and make blue velvet cupcakes? bhagyashree: The colour here is given by the beets. I don't think they would react very well and bring out the blur colouring for the blue cakes you want to make. Do you think I can use whole wheat flour instead of plain flour? Vasudha- you can but you the colour won't be so vibrant and the texture won't be so light. Us how to make eggless lady finger biscuits for tiramisu? Can u tell me which cocoa powder have u used?.. I tried this recipe today but it turned out brown. Do u use natural cocoa in this recipe? dipti-I either use Hershey's or Hintz cocoa powder. Uma- glad to hear that! What other methods could I cook the beets if I dont have a pressure cooker? Hema: Thrilled to hear that! Congratulations! aish: You can cook the beets in a saucepan with enough water until the beets are cooked, that is until you are easily able to run a knife through the beets. Hi instead of beet root, if I use food colouring do I have to make any chanes to the recipe? Kriti: Apart from giving colour, the beets give texture and consistency to the cake. So, a lot of changes will need to be made if you decide to skip the beets. I followed the recipe to the T… However the cake rises initially but became flat gradually… It was quite dense and not spongy at all… Any idea where I could have gone wrong? Reena: Please refer my baking FAQ.http://www.divinetaste.com/faq/ Also make sure that you measure out the ingredients properly in metric to get the best results. I really liked the results of using a soaking syrup, as per your birthday chocolate cake recipe, and would want the similar results for this cake too. Please, suggest if the same approach is recommended or any other alternative. Hi…this is an awesome recipe…I tried yesterday but my cupcakes came little dense maybe Bcoz of over mixing..will redo today..also can I use butter instead of oil as I didn't like the taste of oil..
Devasena: Every recipe is different. Havent tried this cake with soaking syrup. Shilpi: You can use melted butter. If you use flavourless oil like rice bran oil, you won't be able to smell it. Oil does a great job in this recipe. Isha: Please make sure that you use fresh beets. Hi,your recipe sounds very tasty but i want to know ,if we dont want to use oil then what should we use in place of oil ??? Lokanksha: This recipe works best with oil, making the cakes soft and moist. You can replace it with melted butter. I have non fruit vinegar synthetic prepared from acetic acid. Can this be used? I see vinegar prices vastly different for cedar and this. Hence checking to be sure. Tanuja: Yes, you can use the synthetic acetic acid. Hi, I finally made the cup cakes today n they turned out awesome. The cupcakes were perfectly soft n moist. They had a nice deep red colour. N had no taste of beet. The cream cheese icing tastes great too, but just one thing…, my icing was way too runny, I added some more icing sugar n beat it again, to try to make it bit stiff, but didn't help. I realised it was looking a bit curdled n also perhaps there was a bit of fat separation ….. Could u pl guide me,what did I do wrong… Is this because of over beating?…. Or something else pl? Taruna- Glad to know that the cupcakes were good. If you over beat the icing it can get curdled. You need to beat lightly until all the ingredients are well mixed together. Hi…I'm looking forward to trying this recipe..when I was a kid my aunt made this cake for my birthday every yr..I've been on the hunt for a recipe that tastes like hers..I think the original cake had boiled icing..as it was throughout the 1960's that she made it for me..pretty sure she made the original all those yrs..I'll be bookmarking your blog..I'll surely be coming back. Wende- Would love to hear more from you! 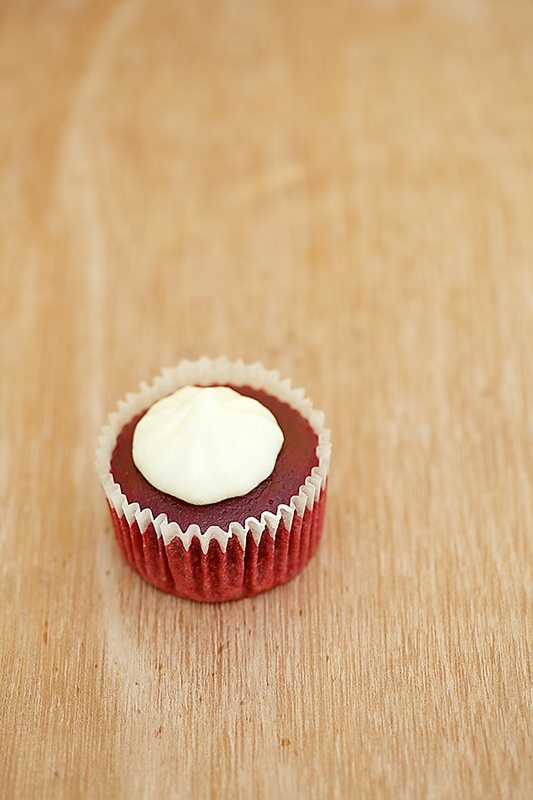 Yes I tried ths receip also today…Turned out really perfect…awesome red with out any artificial colouring. so far..ur receipes never fail…the way u explain and write each and everything in detail helps a lot. Making such good cakes without eggs..really mindblowing. Keep posting more f such receipes. shobha- Thanks for the feedback! Hey this is very nice recipe, i would definitely try this at home. I would like to ask you if I can add dry fruits to it while baking, will it work or no? I have been trying few of your eggless cakes. Thank you for sharing. Recently, I tried red velvet cake..made whole cake n muffins with extra batter. Consistency of the cake n taste was good. But the Entire cake was not red..top was red and the rest kind of brownish.anything can be done to rectify. Shilpa- You can try adding dry fruits to my basic eggless cake recipe. Not sure if it would work here. Kasturi- It could be because of uneven temperature and the size/tin of the pan. Hi Anu! Really can't wait to try this stunning recipe but one question. Cream cheese is not readily available where I stay. So could you suggest another way of being creative with the frosting? Thanks in advance! Poonam- You can use cream cheese. Hii.. the recipe looks great!! Can the recipe be halved? since i have a muffin tray for only 6 cupcakes..
Can I use balsamic vinegar? Is it possible to replace it with lemon juice, if yes then whats the quantity? Hema- Yes it can be halved. Anushree- You can try plain vinegar. Balsamic vinegar wont work here in this recipe. First of all you have a lovely name..Thank you for this wonderful recipe.I made it yesterday..I made few changes.I used whole wheat flour and coconut sugar.Also I made it into a cake.I did the mistake of using a single small pan instead of two small pans..Cardinal mistake! !So it took me around 1hour to get it done.But the end result was good.But the color was completely gone.It was a vibrant pink over the top.But it was not at all red inside.Is that 1 hour in oven took away the color?I have previously made cup cakes using beets and whole wheat flour and it came out brilliantly red.But that recipe used lemon juice instead of vinegar.But I liked the taste of your cake and want to make it again..So should I use lemon juice instead of vinegar or just by baking it into two cakes will solve the problem?Thank you and sorry for the lengthy comment..
PeekaBoo- Thank you for the compliment. 🙂 I use vinegar in some recipes recipes as it gives a standard result as opposed to lime juice which varies in acidity. Using correct sized tins is very important in baking. 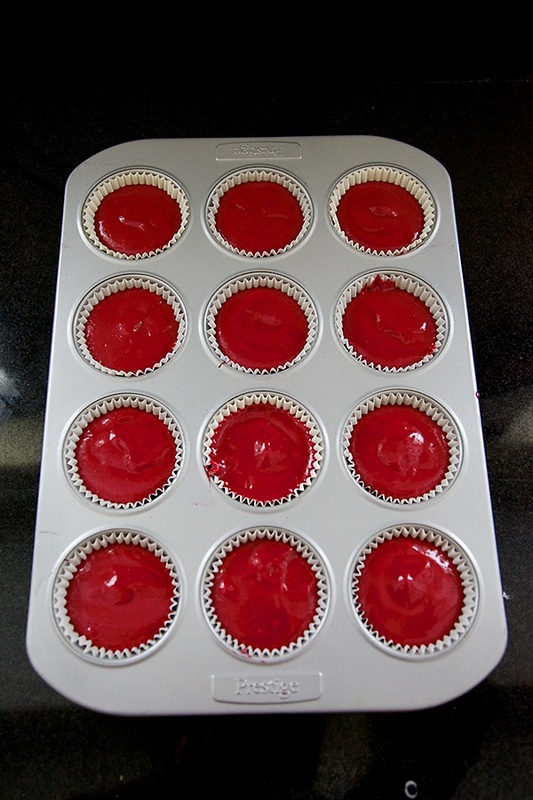 Make these into cupcakes or use the right size of tin for optimal results. Ambika- You can double the recipe! Can you please confirm me about baking powder?It is 11/2 or 1/2 tsp. Making this cupcake for the second time. Quite yum. I refer to your receipes quite a bit. Two questions regarding this receipe. 1) Can I add anything to reduce the beetroot flavour? A mild taste is there. 2) The cake is "very very" slightly sticky, or not spongy enough. Not sure how to describe it clearly. Should I increase the flour content by a couple of tbsps or increase the baking time? Rashmi: Yes, you can increase the flour a little and bake for 4 to 5 minutes more. I want to make this as a cake. Can you tell me how much more longer time to bake and what would be the temperature, or if you have any other recipe kindly share. Instead of boiling beets, roasting them in oven, splash of cream of tartar, with 2 flax seed egg replacement does trick everytime. You can bake this as a cake for 40 to 45 minutes. Thank you so so very much Ma'am. I have a lot of interest in Eggless baking and FINALLY after so many failed attempts i got a recipe with could deliver that soft texture of a cake!! Loved the idea of incorporating beetroot in it. Thanks a lot! Thank you so so very much Anushruti. I have a lot of interest in Eggless baking and FINALLY after so many failed attempts i got a recipe with could deliver that soft texture of a cake!! Loved the idea of incorporating beetroot in it. Thanks a lot! Adamya- So happy to hear this! Beetroot is amazing in this, isnt it?